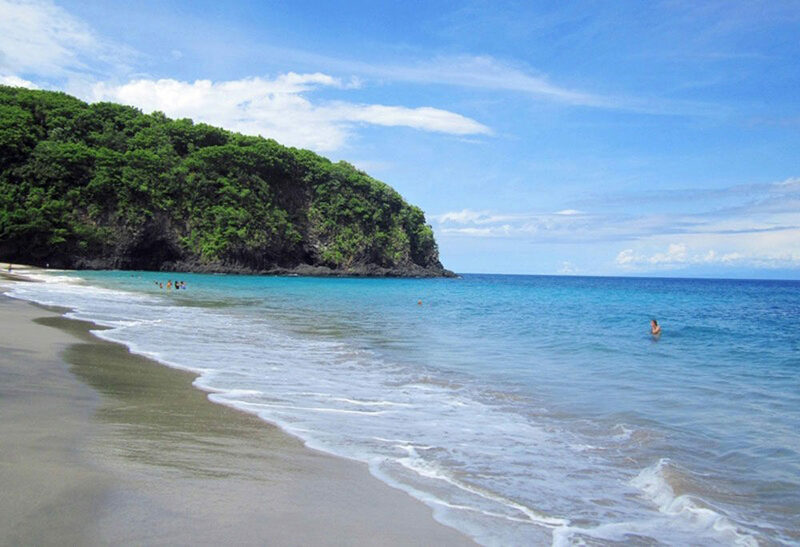 If you’re looking to escape to an idyllic tropical paradise for a few days, Candidasa might just be the place for you. 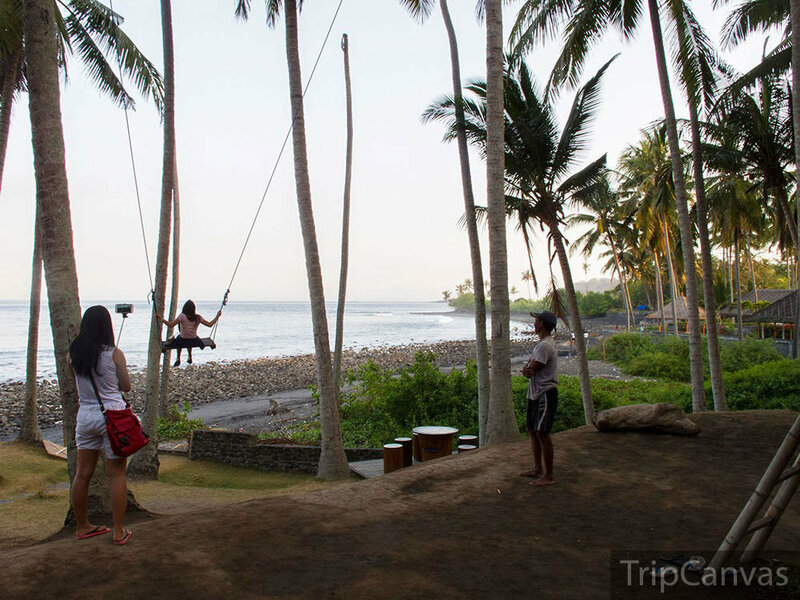 Situated in the east of Bali, Candidasa has been touted by some as the pearl of Bali. It’s easy to see how it earned this reputation. A treasure trove of Balinese temples and hidden beaches, this former fishing village has all the amenities you need for the perfect vacation…without the need to jostle with crowds. Continue reading to find out what’s in store in Candidasa! P.S. If you are coming with your family, you may want to consider these beachfront villas with private pool! 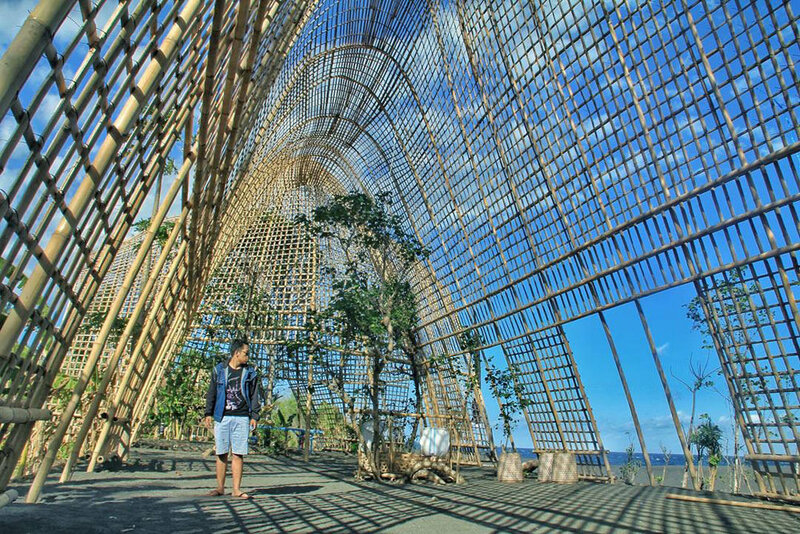 Trust us, we’re as surprised as you that there’s so many amazing things to be discovered around Candidasa – and Rumah Bambu Pengalon just might be the cherry on top. 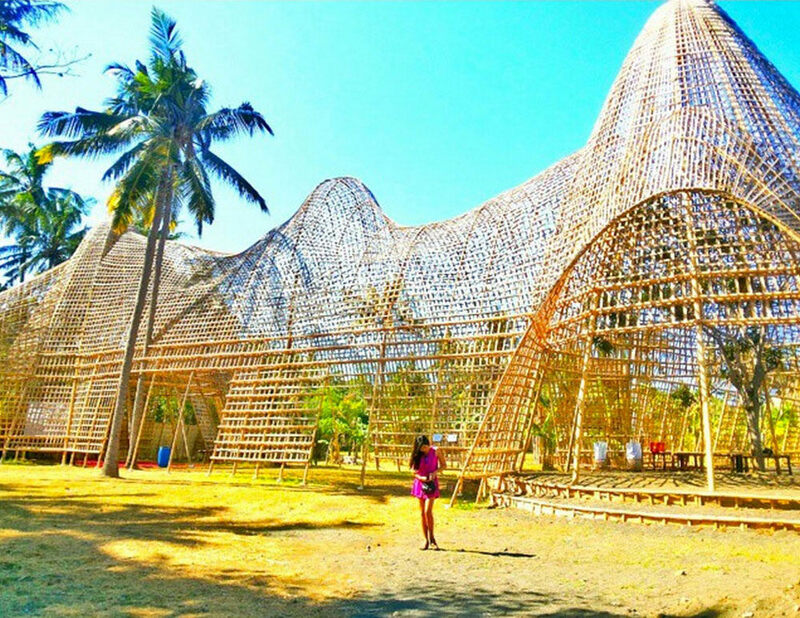 Although this project has been cancelled, Rumah Bambu Pengalon is still a unique construction of beautifully architectured bamboo houses worth visiting. 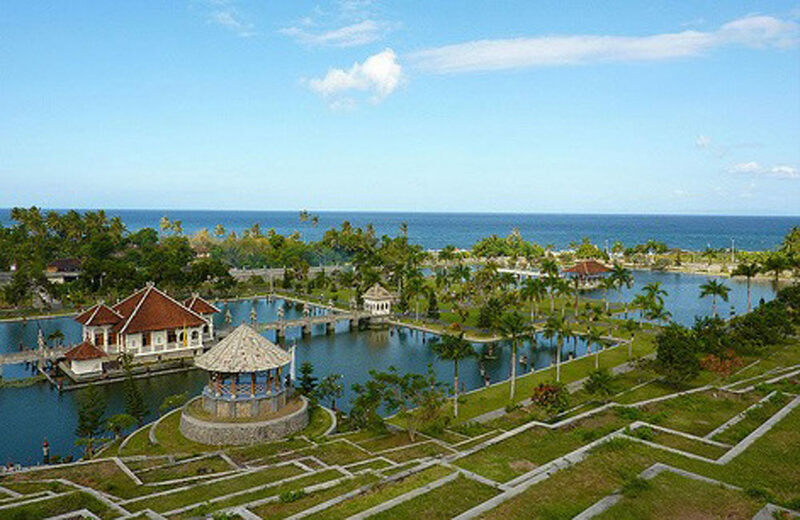 Initially planned as the venue for a music festival, Bali Unite, the views here are surprisingly incredible with a small and beautifully clear lake just around the area. 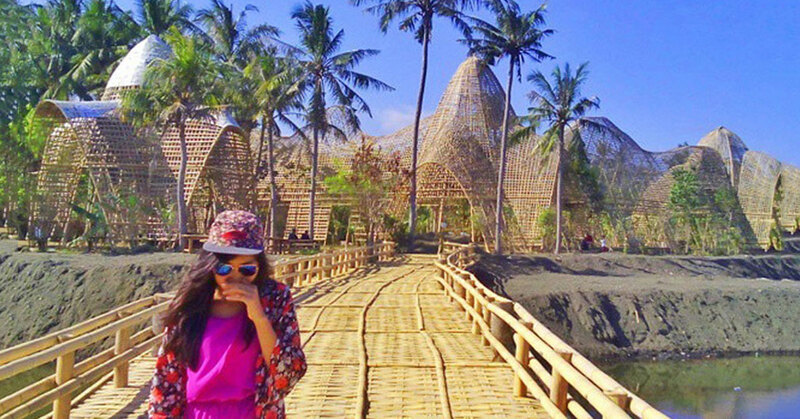 Another instagram-worthy location, finding Rumah Bambu Pengalon might be a little confusing, but it will definitely be worth your journey. Getting There: If you are coming from Denpasar, turn right after the petrol station at Yeh Malet (after Goa Lawah temple) – right next to the Desa Antiga East office. Drive 400 meters further in from the Amlapura – Denpasar highway, follow the unpaved road, you will be able to reach here. Have you always wanted to know what the inside of Charlie’s Chocolate Factory looked like? Well, you don’t need a Golden Ticket to get to this Charlie’s Charly’s Chocolate Factory. Candidasa is also known to have a plethora of affordable beachfront resorts, where you pay 2-3 star price for a 4-star experience. 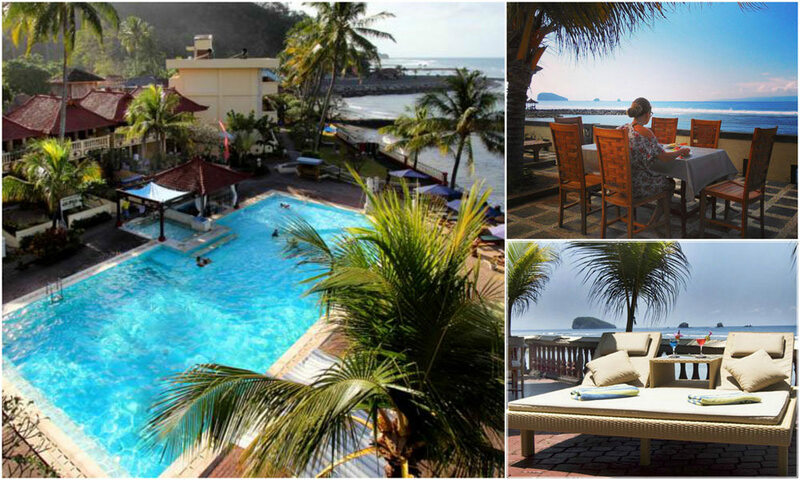 Try Bali Palms Resort, Segara Wangi Beach Cottages or Pondok Bambu Seaside Bungalows, all for under $50! 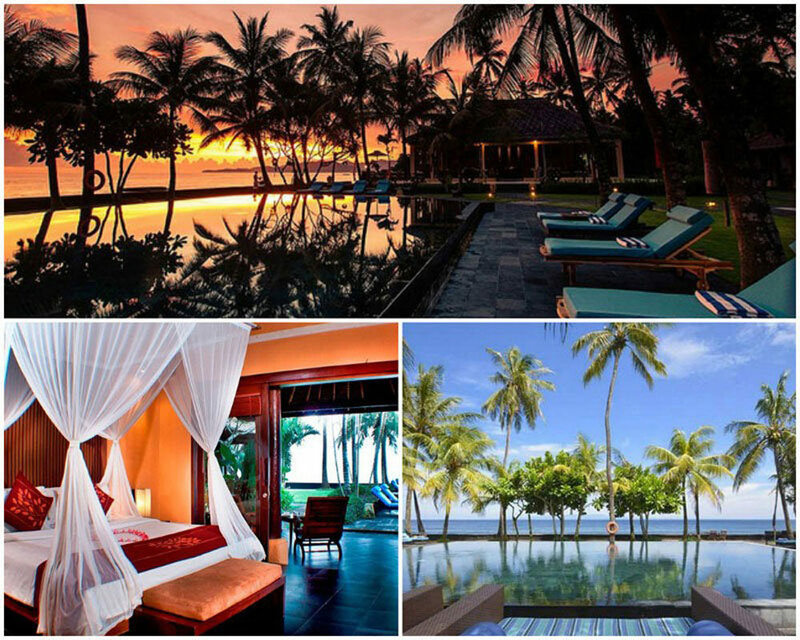 If you can spend a couple of bucks more, our recommended choice would be Nirwana Resort & Spa. It’s only a stone’s throw away from the ocean, and boasts picturesque views of the mountains. There’s also a restaurant that’s right by the infinity pool where you can spend days just lazing and watching the drifting clouds. Best of all, cocktails can also be delivered right to you, as you laze by the infinity pool, gazing out at the gorgeous views of ocean, and mountains. But of course, we’d advise you get the most out of your time in Candidasa – and leave this nirwana – to check out all the activities above for the perfect island getaway you’ve always wanted! 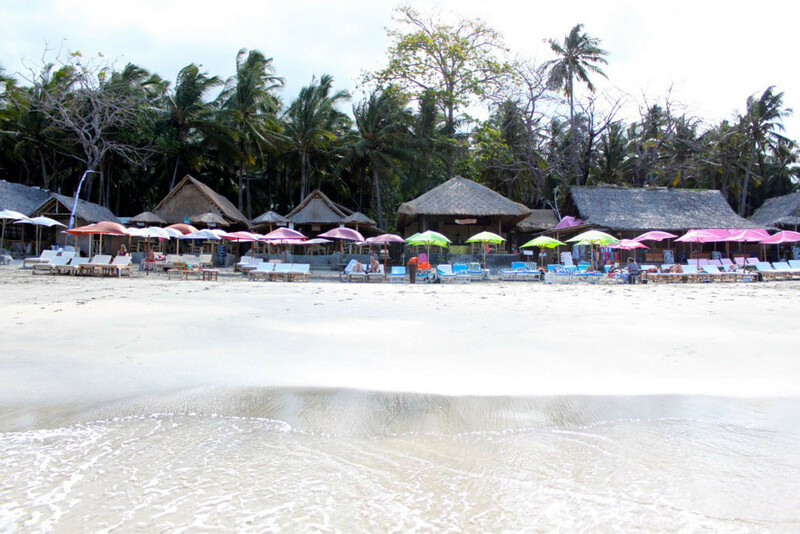 Pasir Putih, which translates to White Beach, is one of the most idyllic beaches in Bali. 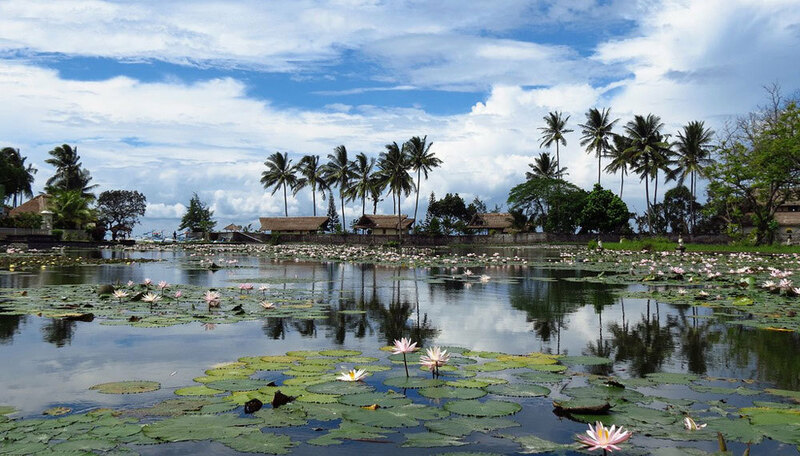 Tucked away in a village named Perasi, you’ll have to make a 90-minute drive from Denpasar, the capital. The scenic view is definitely worth venturing through the rocky trails though. Besides, it’s always fun to take the path less travelled! 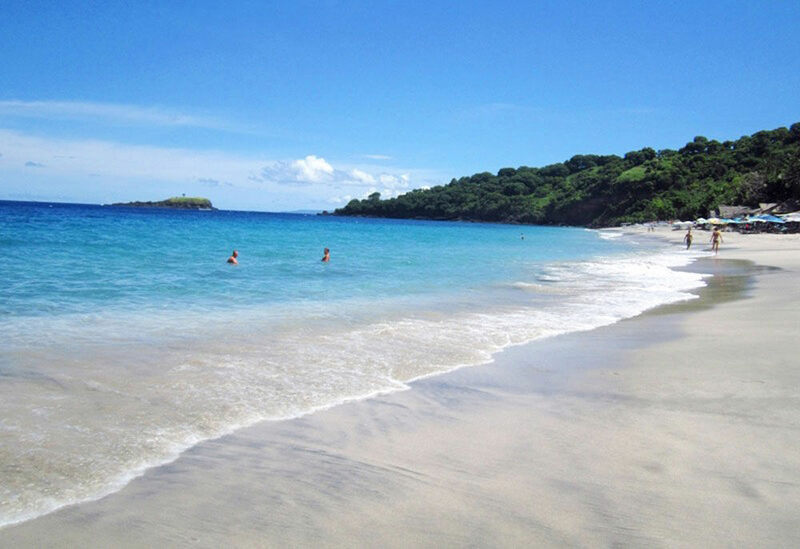 The aquamarine water and pristine white shores are relatively untouched by civilization, aside from a small stretch of local restaurants, better known as Warungs. Because of its secluded location, you’ll never have to worry about jostling with tourists for space. 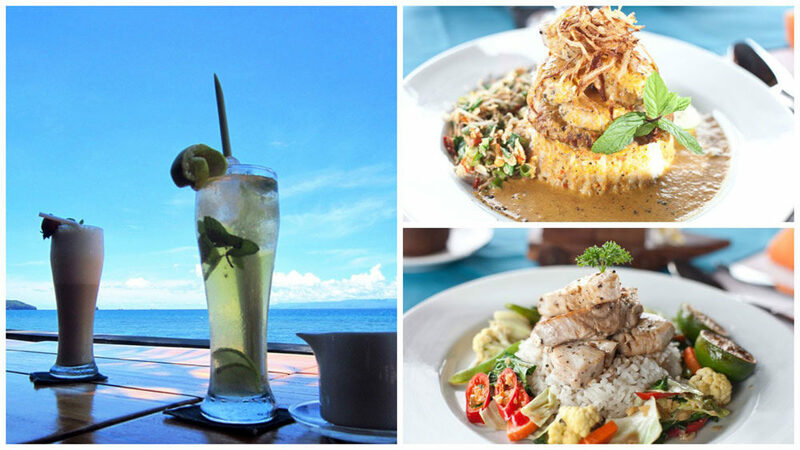 Simply take a dip in the aquamarine water whenever you want, rent a lounge chair to soak up the sun, or indulge in some delicious local food at a Warung. Experience this exquisite stretch of sand, before it becomes a popular tourist spot. And if you revel in secluded tropical paradises, check out our previous story on hidden beaches in Bali! 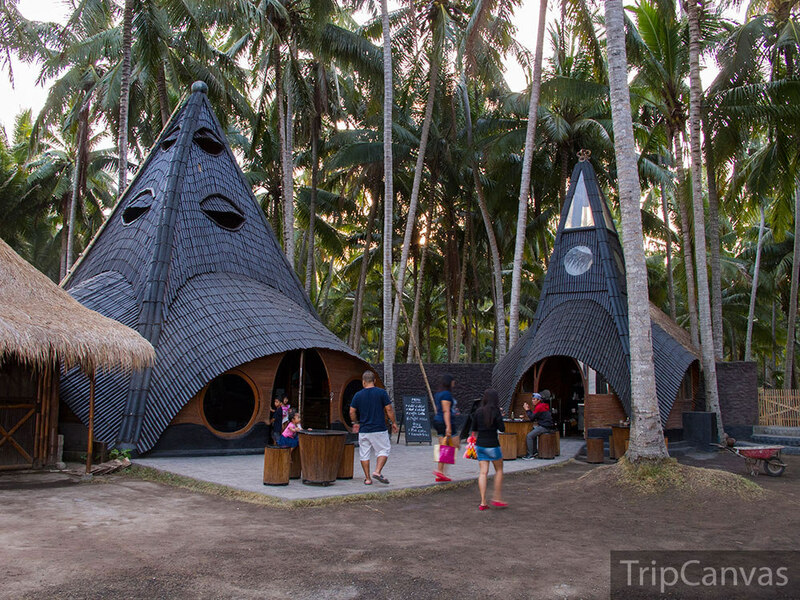 Getting There: Located off of the main road in Perasi, East Bali, and 4km east of Candidasa. Drive East from Kuta towards Sanur. Take the Kusamba Bypass to East Bali. Follow the coastal road past Candi Dasa. When you come to Perasi, slow down and ask locals for ‘Pasir Putih’. If you happen to visit Candidasa in June, you should make sure to participate in a ceremony known as Mekare-kare. 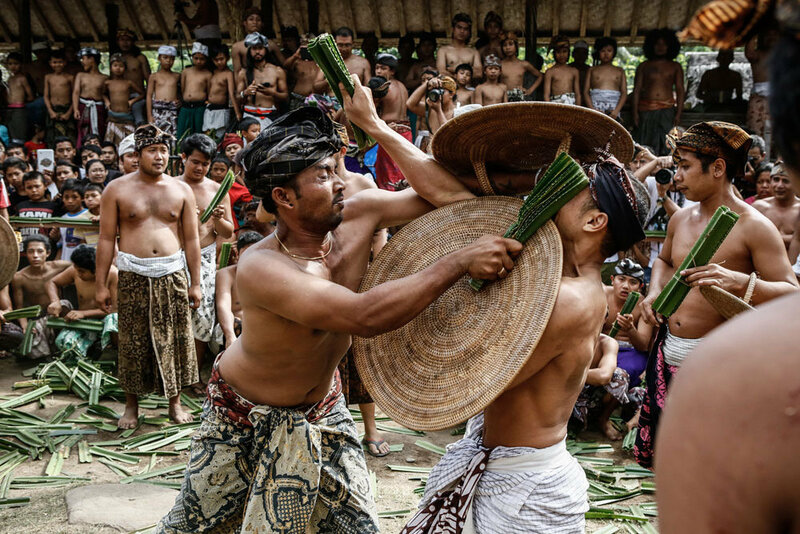 Also known as Perang Pandan, it’s an annual theatrical fight amongst Balinese men to honor the God of War as well as their ancestors. 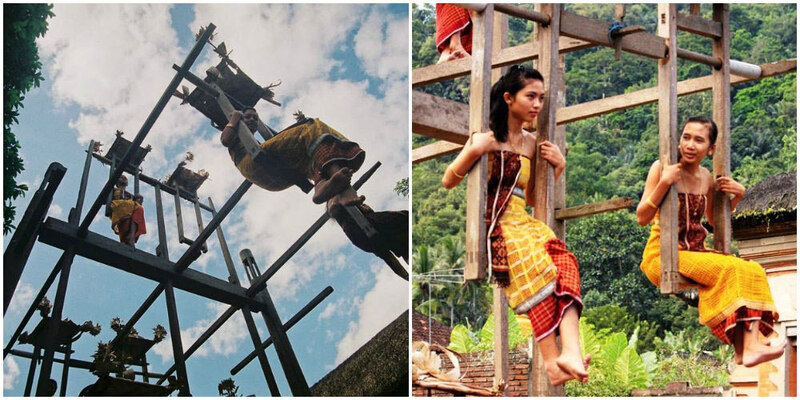 This tradition is unique to the village of Tenganan, and the event lasts a month long. During this period, all villagers will dress in traditional Tenganan clothing. All males, from young to old, will participate in Mekare-kare by fighting with an opponent. 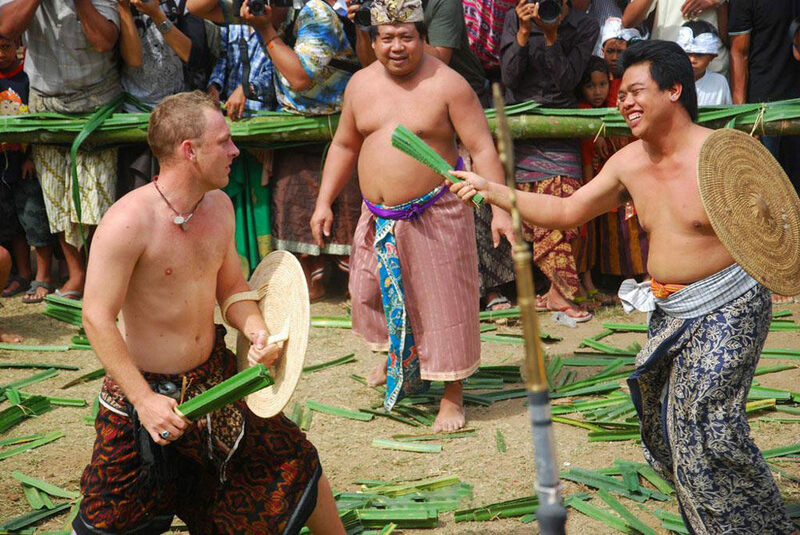 Dressed in just a sarong, two men at a time fight on a central stage…armed with (surprisingly sharp-edged) Pandan leaves and straw shields. This match usually lasts less than a minute, and the next match continues until all the males in the village have participated. Boys, if you’re feeling up for it, you can also participate. Otherwise, sitting amongst the villagers and cheering is also quite the experience! During this festival, there is also a traditional ferris wheel made entirely out of wood for children to play with. 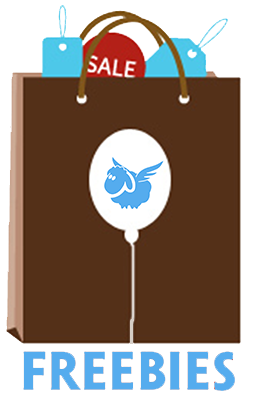 If you have children, this would truly be an extraordinary experience for them. Afterall, how many of us can say we’ve sat on a handmade ferris wheel? 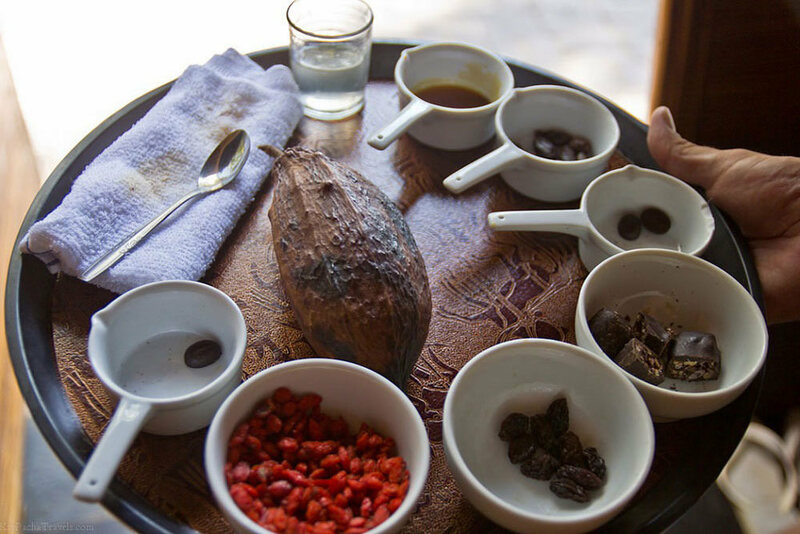 Making a visit to to the ancient village of Tenganan in June to experience one of the most exciting village customs will definitely be an enriching experience – as well as indelible memory that you will not be able to replicate elsewhere. While we’ve already mentioned one water palace, we simply had to add this in. 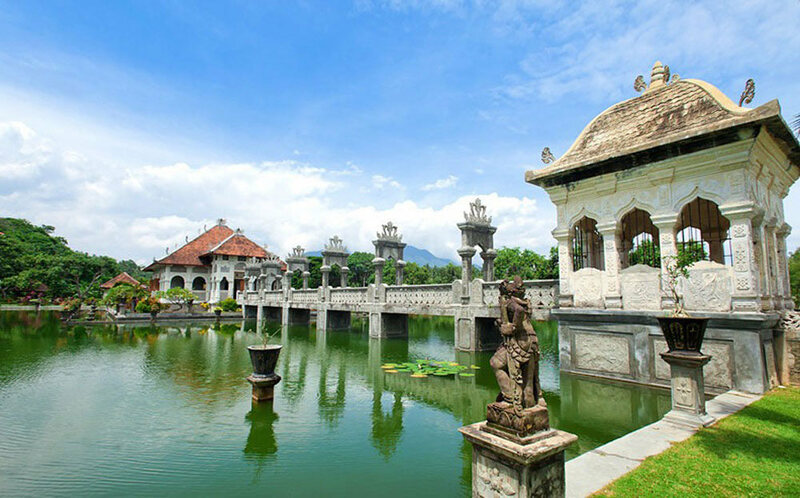 Tirta Gangga Water Palace will pleasantly surprise you with its incredible architecture and design – and the cultural significance behind it. 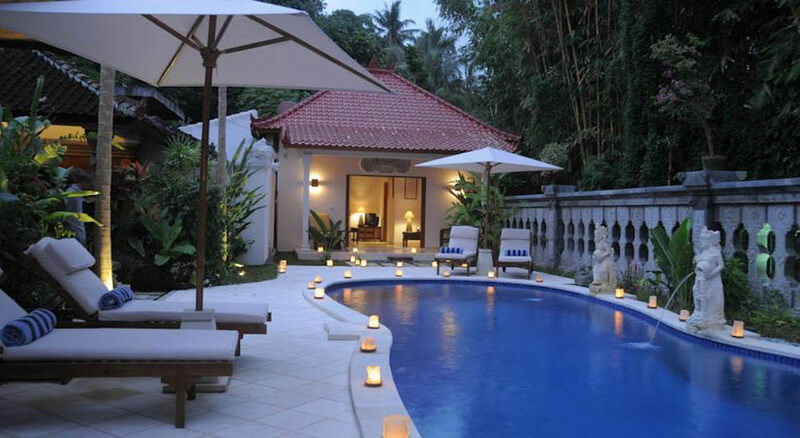 A unique mix of Balinese and (surprisingly) Chinese architecture, you are sure to get some of your favourite holiday snaps here. 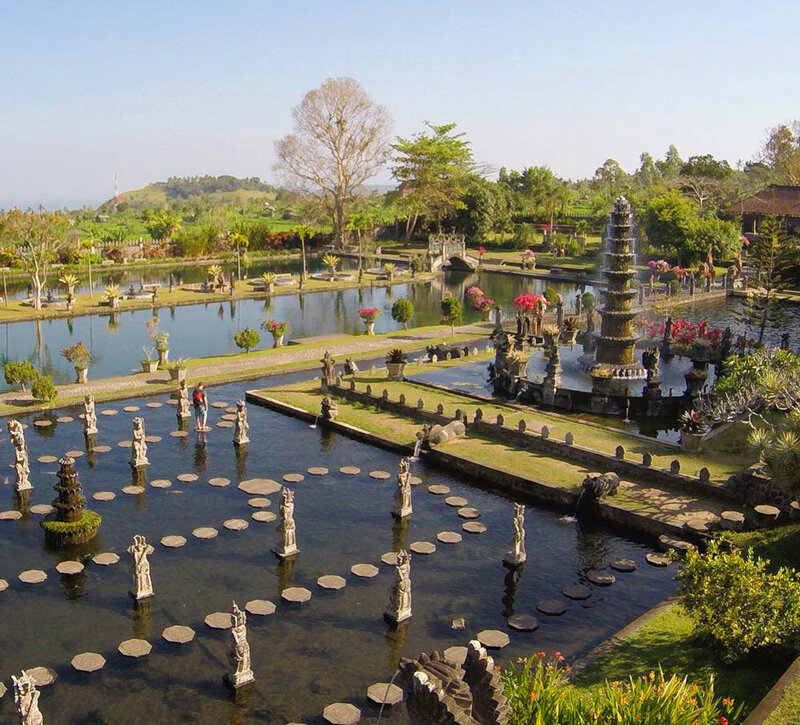 Constructed in 1948 by the last King of Karangasem, Tirta Gangga is royal magnificence come to life. 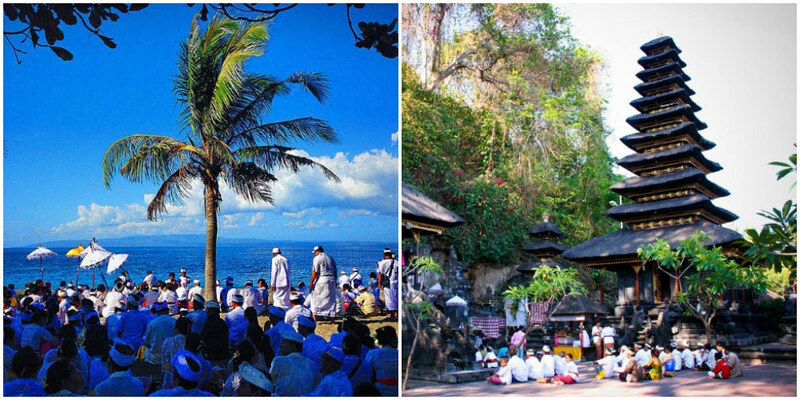 Tirta Gangga (which also means water from the Ganges), is regarded as sacred to the Balinese Hindus – and the holy water of Tirta Gangga is regularly used for religious temple ceremonies. With a maze of beautiful pools surrounding the palace, and many fountains (notably, the lovely 11-tiered fountain), sacred ceremonies with colourful processions are often held here – and you just might be able to catch one happening when you visit! Ps: If you’re interested, villas are available for rent, and you’ll get to swim in the pool (with holy water) too! Be amazed by the grandeur of this royal abode the moment you step foot on its grounds. 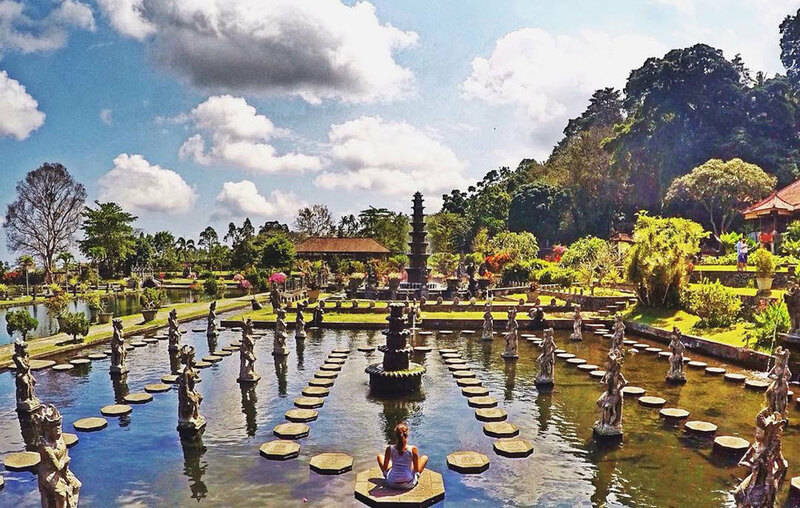 Built in 1919, Taman Ujung Water Palace, also known as the Karangasem palace – was once the recreation and relaxation site of the King of Karangasem. Here, endless lush tropical verdure mark out the parameters of the palace, bringing visitors a sense of calm and tranquility. If you’re observant enough, you will realize that the water palace incorporates elements from Chinese, European and Balinese culture. 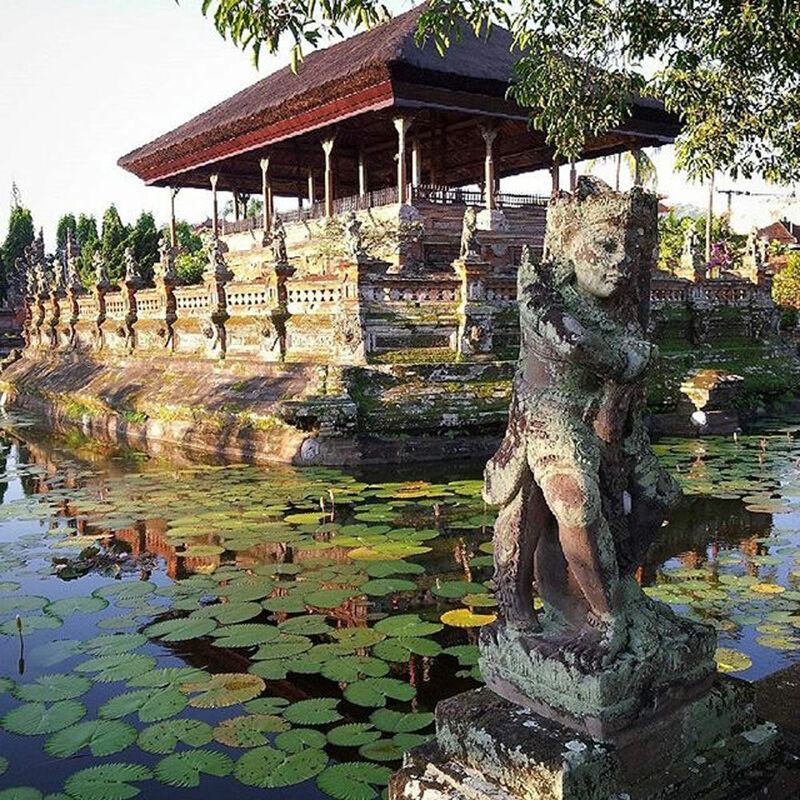 One of the key features of the palace are the three large ponds, connected by the long elegant European bridges (what great lengths the Balinese royalty go to for relaxation time… ;p). 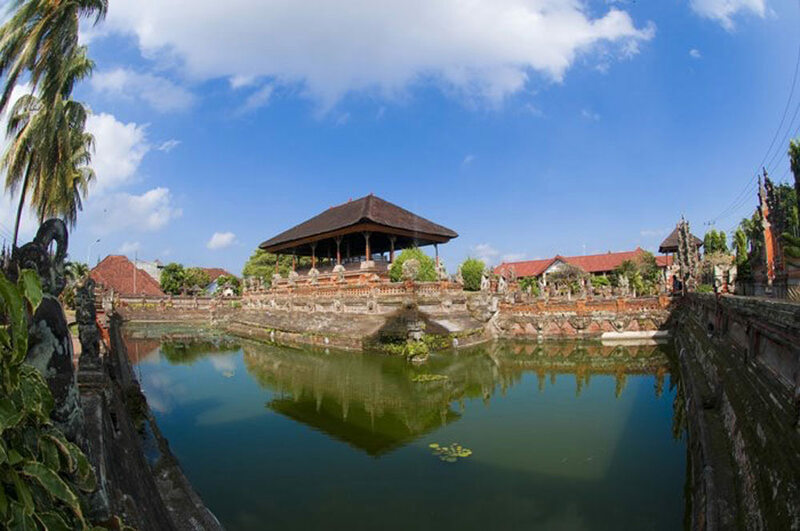 While you’re here, take some time to wander around the grounds of the palace, and be transported to a Bali of another time. 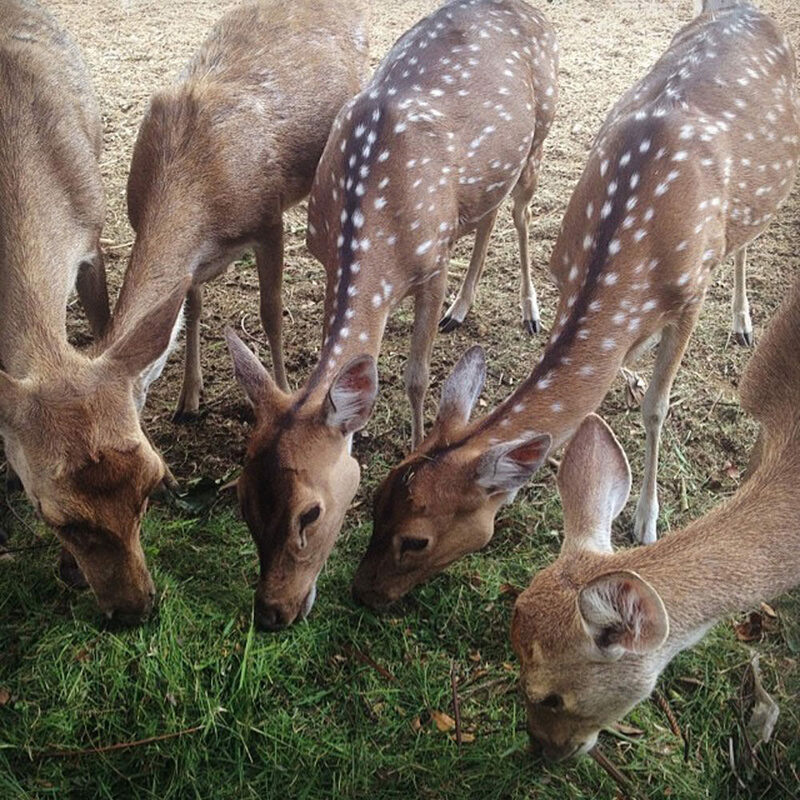 Additionally, check out the deer roaming the compounds too! Although you most probably won’t be able to tell, this palace was almost completely destroyed from the eruption of Mount Agung in 1963 and a subsequent earthquake in 1979. Restoration works are now almost complete and the palace is a favourite spot where Balinese couples take their wedding photographs. While you may not be here on honeymoon, or here to take your wedding photos, you need no excuse to take beautiful pictures with your family and friends when you’re in such a beautiful place! 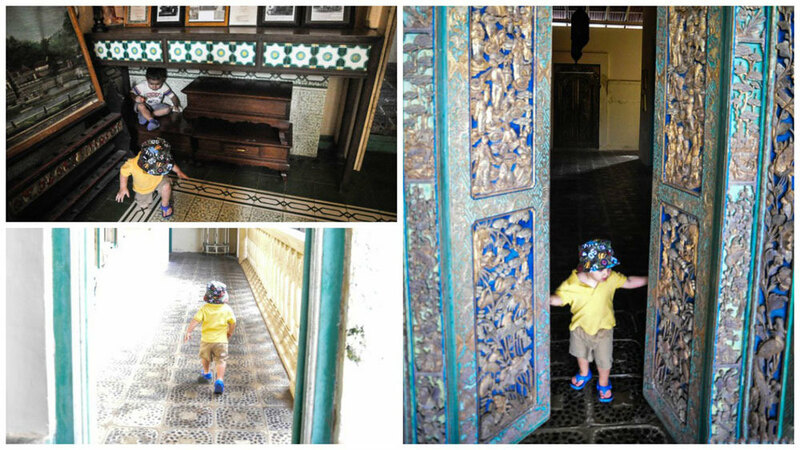 If you’re feeling more adventurous, you could also climb up the stairs for a bird’s eye view of the palace and the ocean. Truly, the view will be worth it. 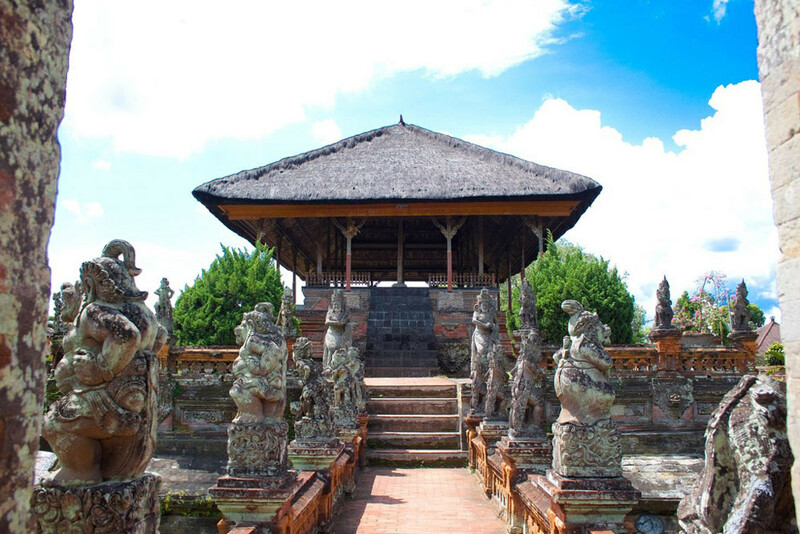 When you enter the gates of the Kertha Gosa Pavilion, you may think that this is just another Balinese pavilion or palace. However, the Kertha Gosa actually first served as a court of law in 1945! Jokes aside, the Kerta Gosa is truly a sight to behold. Every inch of architecture is intricately carved and remember to look up as you walk through the corridors of the grand hall. 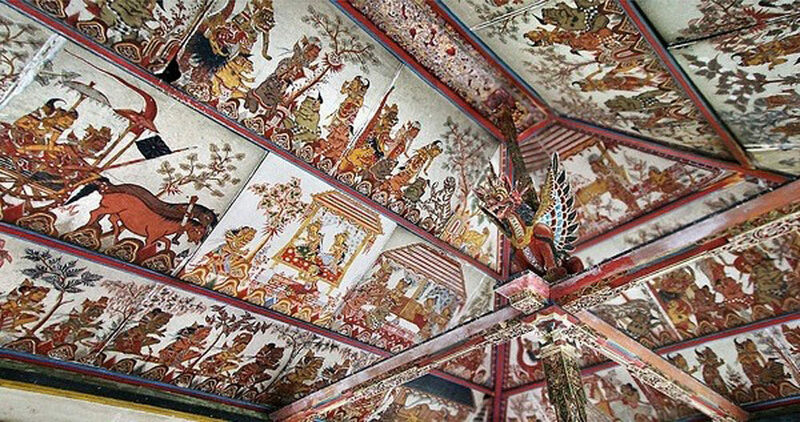 The ceilings of the corridor are painted with vivid wayang motifs depicting the punishments in afterlife. Some say that this was for the viewing (dis)pleasure of convicts, while they awaited their punishment. While you’re exploring the courts, just take a moment to soak in the grandeur of a forgotten time, and appreciate the beauty of the architecture. 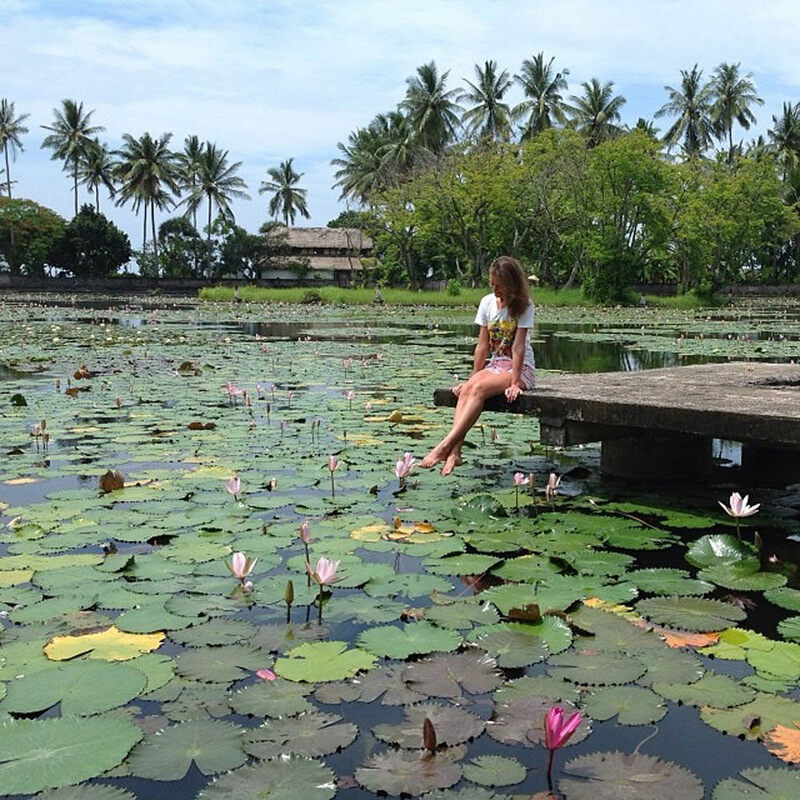 Get ready to be transported back to ancient Bali as you step into the Lotus Lagoon. Best of all, it’s also one of the many things you can do in Bali for free! While you’re here, why not take some time to visit the temple just across the road? And if you would like to travel further, you can visit the temple that Candidasa was named after. Built on a hill, you may get a greater view of the natural lagoon and seascape. Although it may be small, Goa Lawah is one of the most spectacular temples in the world. Built in front of a cave atop the coastal cliff, the beautiful temple overlooks the ocean. But what makes the temple truly unique, are the fruit bats that reside in the cave. 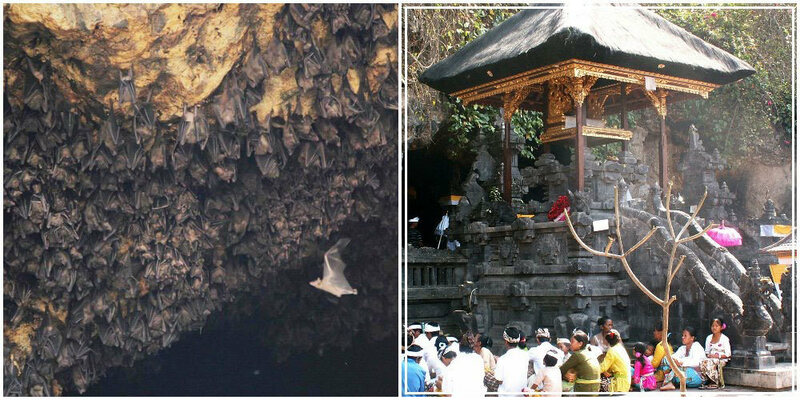 As devotees pray to the intricate statues placed at the mouth of the cave, thousands of fruit bats deep in slumber are in full view. They’re so densely packed together, that the cave walls actually look muddied from afar! Aside from the natural wonder of the bat cave, the man made architecture of the temple is also quite stunning. Intricately carved and gold plated, one cannot help but wonder how the temple was painstakingly forged a thousand years ago. So why not take a tour to the Goa Lawah temple? 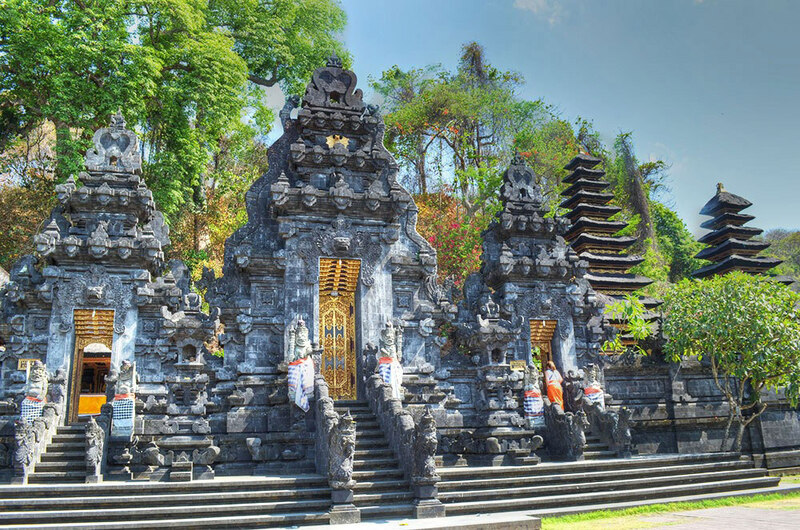 It is only an hour’s drive from Denpasar – and you could even head over to the beach to take in the scenic view, after soaking in the atmosphere of the temple. 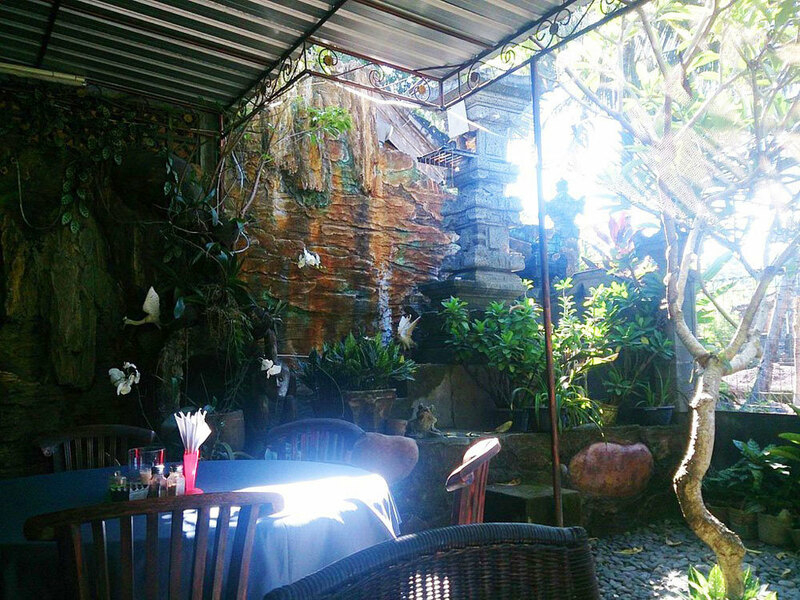 Once a humble family restaurant, Warung Padang Kecag is fast earning a reputation for delicious Indonesian food. 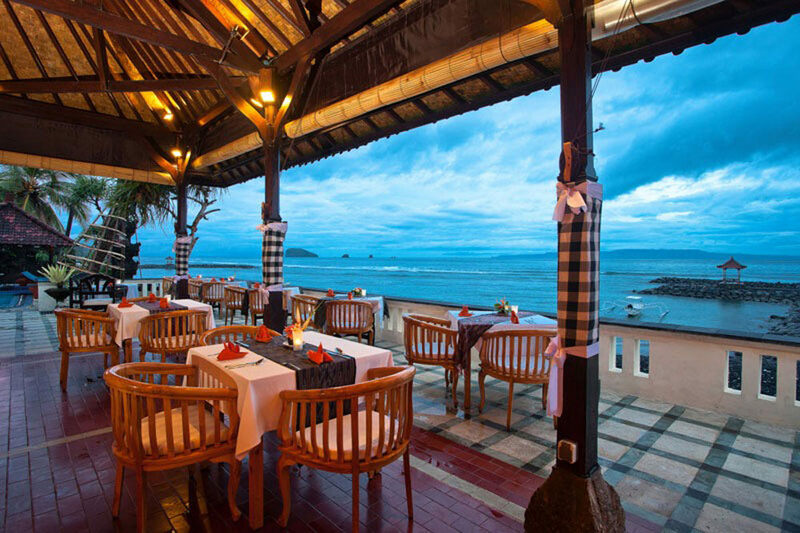 It offers a relaxing open air dining concept, where you get to taste the aromatic dishes amongst lush vegetation. One of the dishes that you must not miss – the Bebek Betutu. A famous traditional Balinese dish, Bebek Betutu is a slow roasted duck stuffed with spices and wrapped with banana leaves. The result is an explosion of flavors and the perfect combination of crispy on the outside, tender on the inside. However, as the dish is slow cooked over a period of 8 hours, do make sure to let the restaurant know our order one day in advance to avoid a long wait! And if duck isn’t your favourite choice of protein, don’t worry! They also serve equally tantalising versions with chicken, fish and prawns. 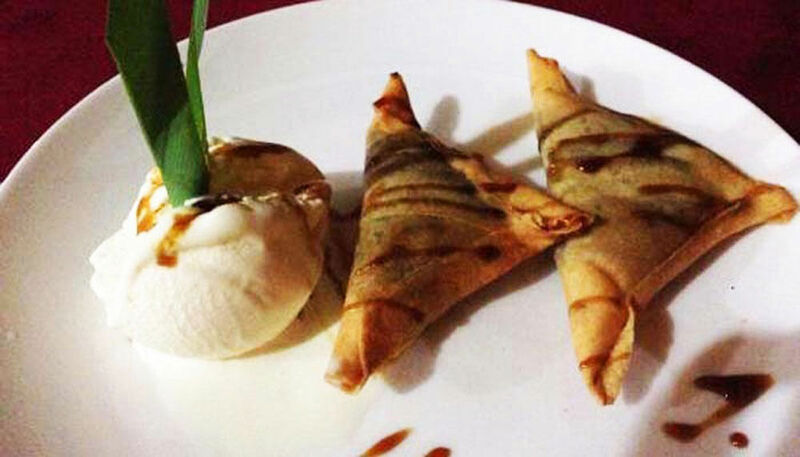 Lastly, if you’re the sort who needs a sweet dessert to round off a perfect meal, then the Chocolate Samosas with ice cream would be the cherry on top. 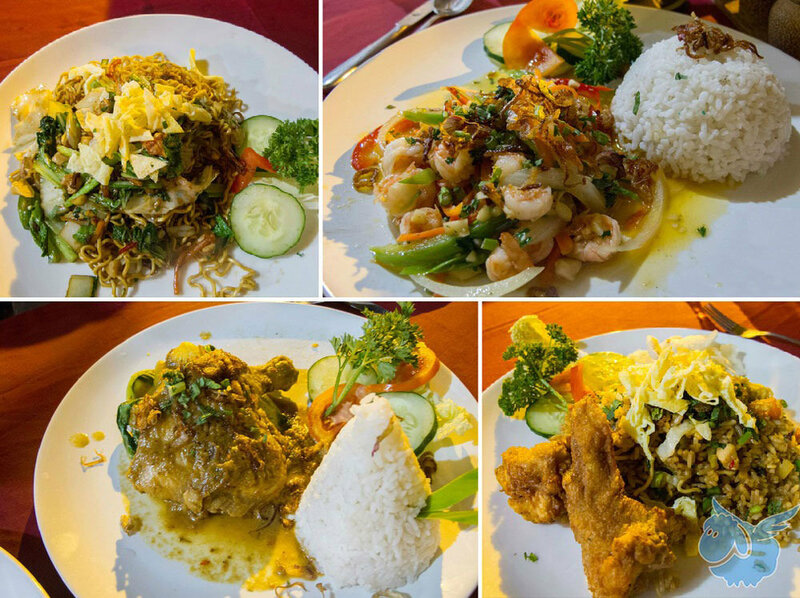 With prices starting from an affordable $4, what’s holding you back from having a great Balinese meal? Aptly named Lezat (read: Balinese term for delicious), this lovely little diner serves a truly incredible variety of food. The main attraction though? 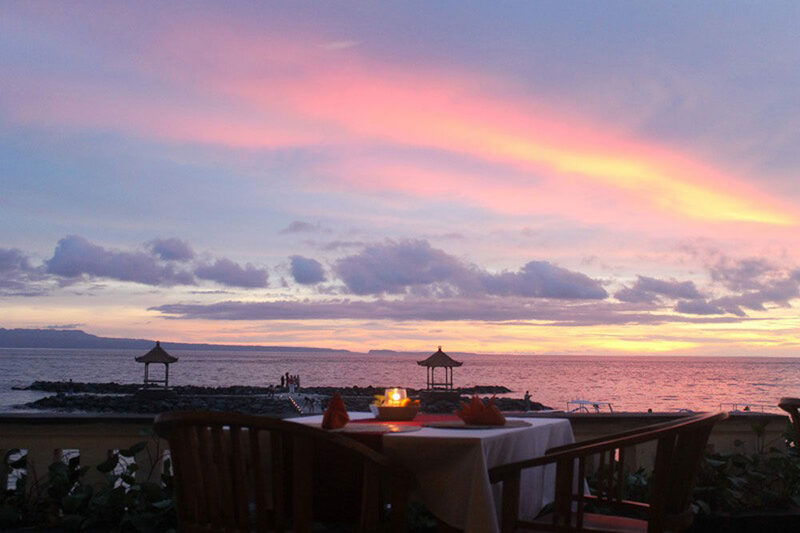 The candlelight dinner menus specially prepared for any couple looking for a truly romantic night. Choose from 2 candlelight dinner menus – Balinese Royal, or Indonesian Ethnic – and anticipate an interestingly delicious Balinese dinner affair. If you opt for the Balinese Royal – you’ll start off with a fish soup with Balinese spices; move on to the Balinese Royal Risjtafel main course (includes steamed chicken, pork sate, duck tutu and more); Dadar Gulung (Balinese pancake) for dessert; and 2 glasses of Balinese wine. Interested in the Indonesian Ethnic? Begin the meal with Potage Dubarry (cauliflower cream soup); Papaya Grilled Prawn Cocktail; Tumpeng Nasi Kuning (includes chicken curry, beef rendang, honey ginger prawns and more); chocolate honeymoon cake; and 2 glasses of wine. With 2 such well put together menus specially for your romantic dinner, Lezat Restaurant won’t disappoint! Although this activity is not exactly in Candidasa, it is (as Barney Stinson would say)…close enough. 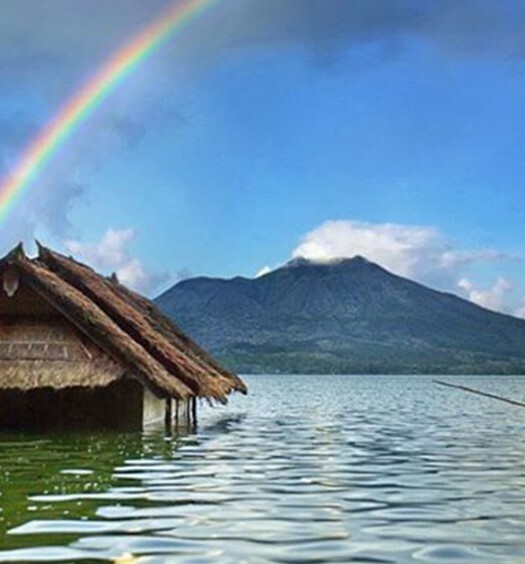 A 30-minute boat ride away, Gili Tepekong is one of the most popular snorkeling sites in Bali. 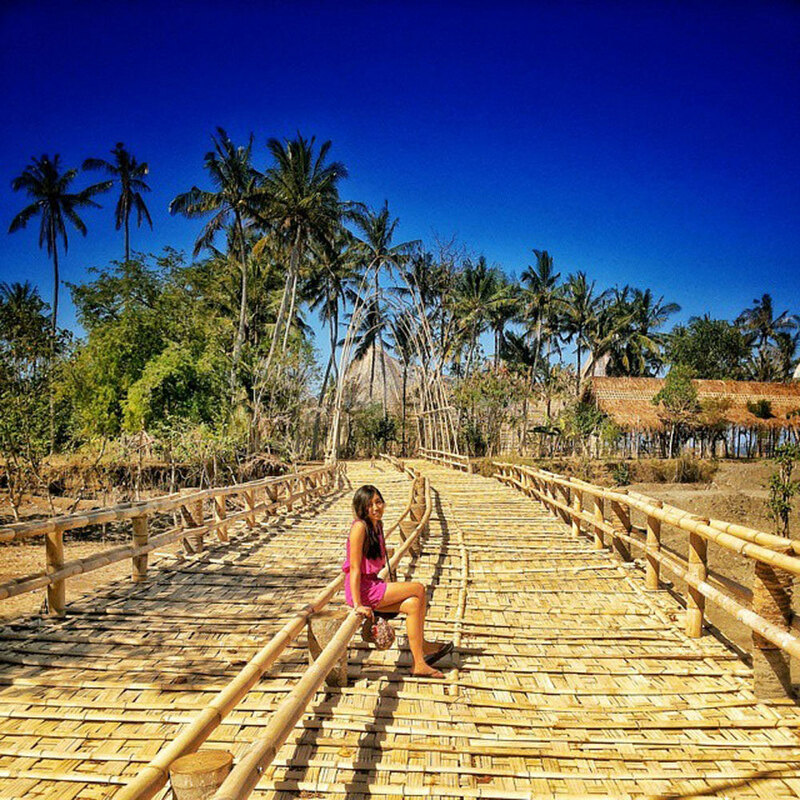 One of the three small islands near Bali, Gili Tepekong is known for its beautiful coral reefs and colorful fish. A transfer boat will bring you out to the snorkelling site before you set off on your own. Swim next to schools of fish, and if you’re really lucky, you might just spot a turtle gliding in the waters. If you’re tired of snorkelling (but really, who would tire of Mother Nature’s wonders? 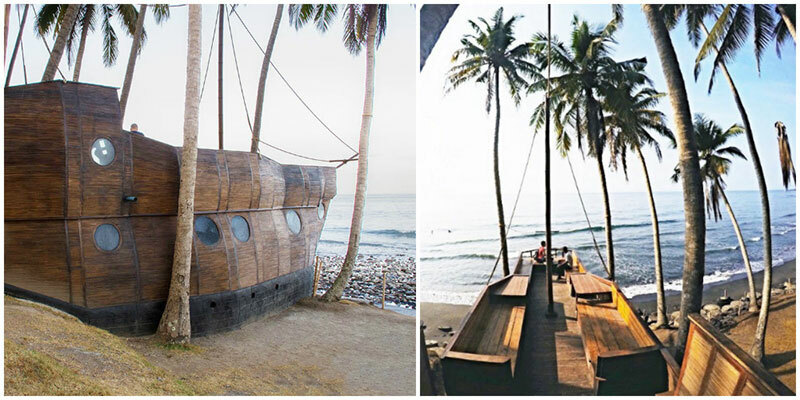 ), you could also float on your back and rock gently to the rhythm of the ocean. Spending a glorious day in the sun snorkelling in the clear waters could never be a bad decision, so be sure to book your underwater adventure when you come to Candidasa. How do you stay in the ocean for an hour without getting wet? In a submarine, of course! 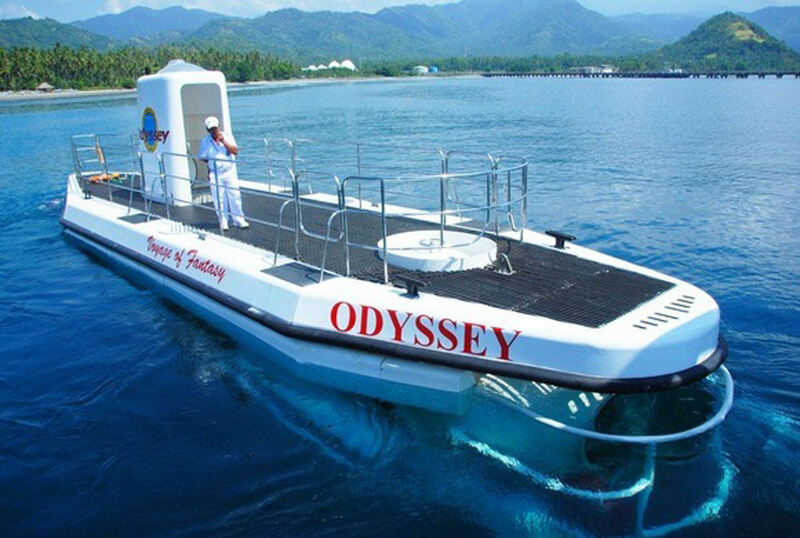 The submarine Odyssey experience is perfect for the family to explore the magical undersea world in a safe, secure and (may I mention) fully air-conditioned manner. 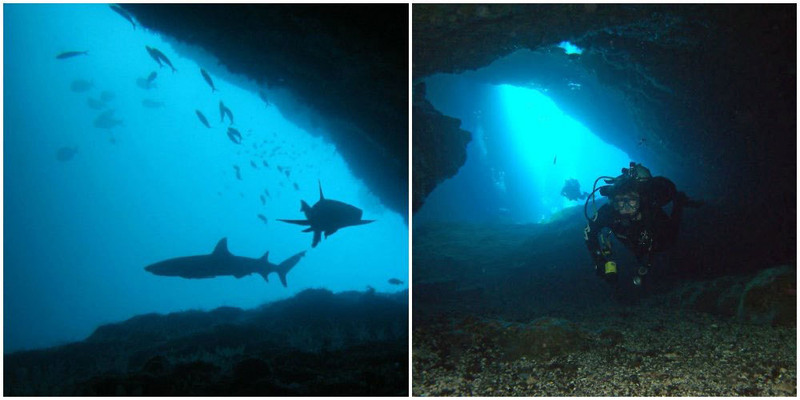 6km from Candidasa – the underwater adventure begins at Amuk village. Passengers are transferred to the submarine via a small boat from Amuk Bay. 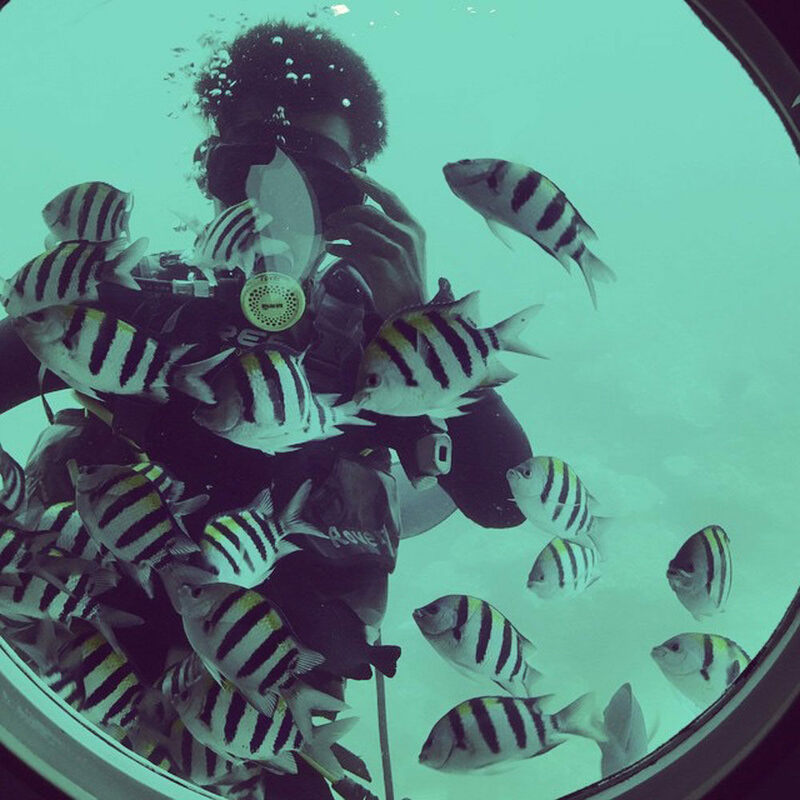 In this 45-minute underwater tour, you get close to schools of unique fish…watch the divers swim effortlessly in the ocean…and even watch how the pilot operates the submarine. What a neat mode of transportation! 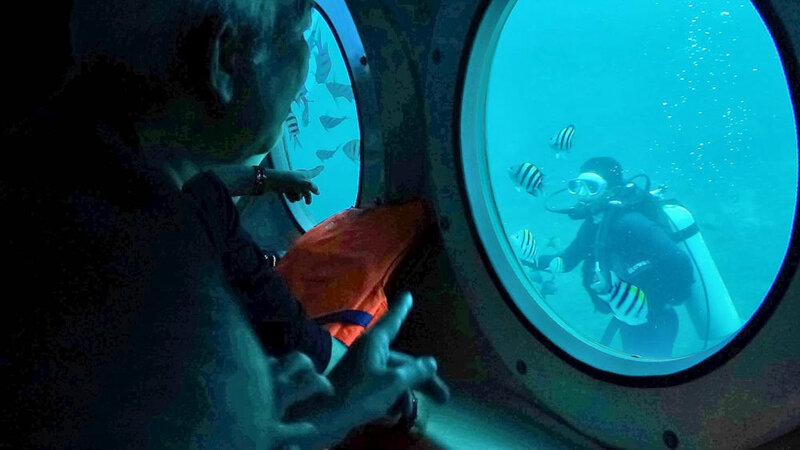 At $80 per pax, the price alone is more than worth it – being able to enter the submarine, and not to mention, explore the magical underwater kingdom. What is most unique about the tour is that it appeals to both professional divers as well as weak swimmers. 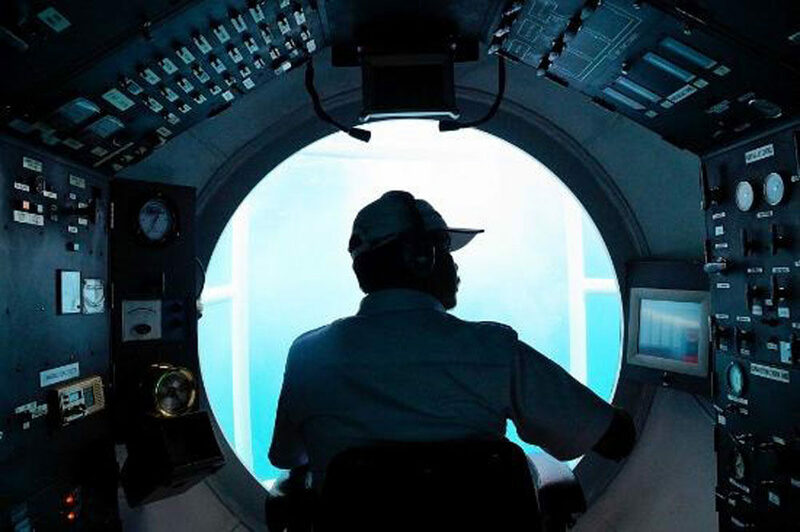 The immersive experience of being 90 feet under the sea will definitely make for a great family bonding experience – and it’s second only to diving in the ocean yourself (but we all know how much work it takes to become a diver of such aptitude). Love water but want to avoid the touristy hotspots? Here’s the perfect solution for you – hold your breath at the beauty of the underwater world with a freediving course in Candidasa! 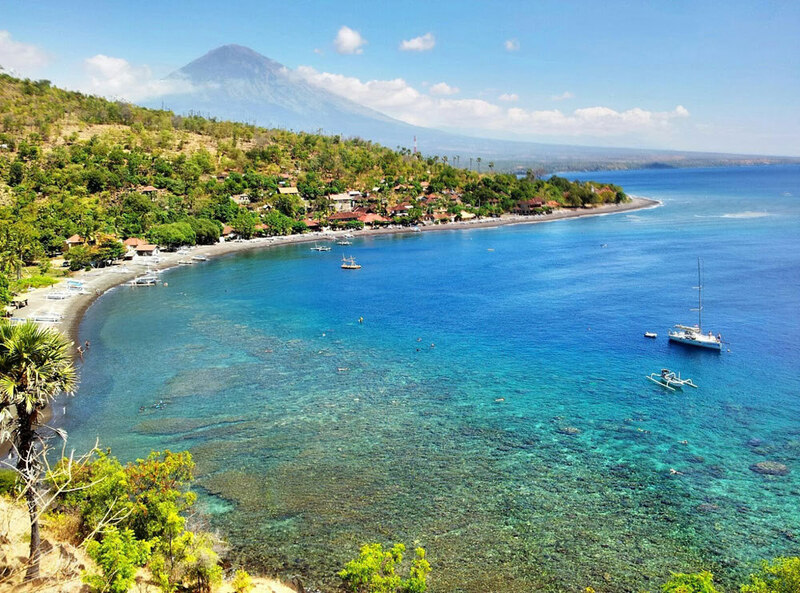 Candidasa is the departure spot for the most spectacular diving sites in Bali, and the quiet waters of Amed’s Jemeluk Bay makes it one of the best places to learn how to freedive. 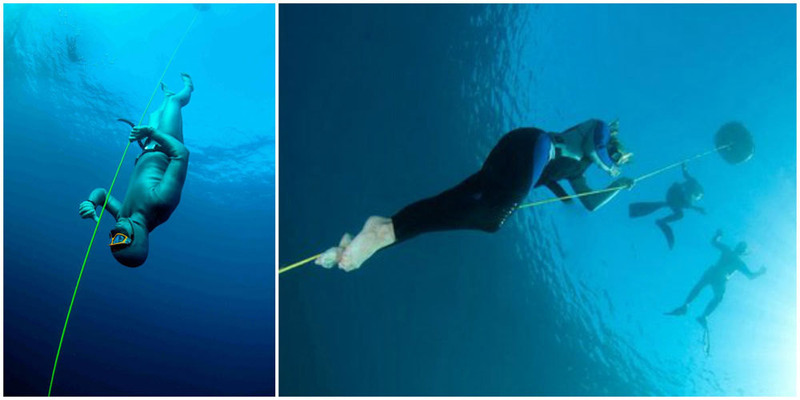 Unlike regular diving, freediving doesn’t rely on breathing apparatus such as scuba gear. Instead, it relies on the diver’s’ ability to hold his or her breath until resurfacing. While it is a sport, it is also a form of moving meditation. And it’s not difficult to imagine how gliding through waters seamlessly, could bring a sense of renewed peace to the divers. If this sounds like your thing, head over to Apneista Yoga and Freediving for a course, and an unforgettable underwater experience. 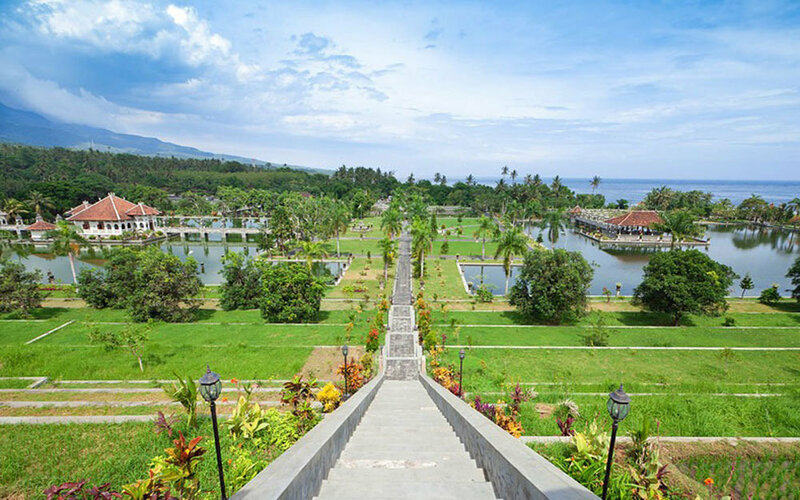 Candidasa has almost everything you could imagine – hidden beaches, great food, unexpectedly cool activities, and some of the most beautiful temples. 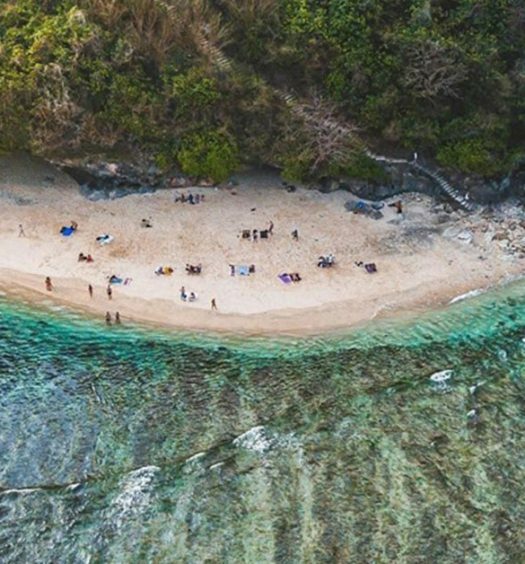 Now that you know exactly what to do here in this island paradise tucked away from the rest of Bali, there’s only one thing left to do…book your flight here! Are there any more interesting things to do in Candidasa? Comment below to let us know!